How did the Navy make Bobby Riggs the world's best pro player? In 1941 Bobby Riggs regained the U.S. National crown he had lost the year before, defeating his bitter rival Frank Kovacs in the final. (Click Here.) But World War II was raging in Europe, and then on December 7 the Japanese bombed Pearl Harbor. Suddenly no one cared much about tennis. There was an abbreviated, sparsely attended pro tour in 1942 with Bobby, Don Budge, Frank Kovacs and Gene Mako. Due to lack of ticket sales many events were cancelled. Budge won the overall tour. He defeated Riggs 15-10 in head to head matches, and so maintained his position at the top of the pro game. The next year pro tennis came to an end for the duration of the war. 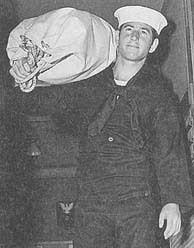 Bobby was drafted into the Navy. Budge had already joined the army, and virtually every other top player was in uniform as well. It was three years before matches resumed. But when the war ended, Bobby emerged as the top player in the game. To the surprise of the tennis world, he reversed Budge's dominance over him, decisively defeating Budge in two newly created professional tourneys. How did this reversal occur? The explanation lies in the untold story of the tennis that Bobby played during the war, including 5 matches with Budge, in an event staged by the armed forces on the island of Guam.